I spent portions of a couple school years while at college helping get a newspaper underway at the Franklin Learning Center, a strong, diverse magnet school in the Spring Garden neighborhood of Philadelphia. So, I was excited to take some time away from my freelancing work once a week to work with the journalism club at Frankford High School. It was a short walk, and I could just fill in the time lost at night. I was suddenly the professional journalist half of a Prime Movers program that formerly had me as the student journalist. I made it a half dozen Thursday after-school meetings, enough to meet the core group of seven or so students and help them launch a WordPress blog for their content, but some rather large, fairly unexpected changes have happened. I bought a house in a neighborhood that made the trip a 15-minute El ride (and added some responsibility) and, as a larger conflict, I then accepted a full-time job. So, now I’m reaching out to a host of colleagues to fill as many of the coming weeks with insightful professional journalists (if you’re in Philly and are interested, contact me). Still, though I’ve worked with high school journalism clubs before and only worked with the Pioneer Times of FHS for a couple months, I certainly learned a thing or too — in addition to, I hope, teaching some of those kids something. 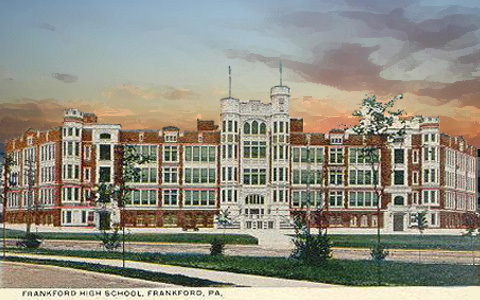 Frankford High School is a school that, like the neighborhood it served, was once lily white and has seen a dramatic complexion change since. According to School District of Philadelphia data, as recent as the 2003/2004 school year, a quarter of it’s roughly 2,000 students were white, but now fewer than one in ten are. While Asian and Latino numbers have remained relatively stable over that time, a school that was half populated by black students in 2003 has now settled around more than 60 percent. That usually makes for some strife, and an uptick in lower income students and suspensions seems to have followed. But it certainly isn’t known to be anywhere near as dysfunctional and (relatively) dangerous as other big public schools in Philadelphia. Rather, it has active after school programs — like the journalism club and its celebrated culinary program, which the focus of a feature-length documentary that debuted last year. Additionally, while the student population’s look has changed, the school still has an active alumni group and some notable ones among them. It was with this knowledge that I first came to the school in October to meet journalism club adviser Beth Ziegenfus, who, by measure of the 10 or so students attendance on that first day, was well-liked and caring. I shared with them the coverage of their neighborhood, from community blog Frankford Gazette, to the localized coverage of NEast Philly to the Northeast Times. Also, over the next few weeks, I came to know a handful of the group’s regularly attending members, tried to dispense as much general knowledge on journalism, writing and multimedia as I could and, yes, became certain of a few truths. Read the take aways from last stint helping to lead a journalism program. Talk to high school kids like adults, because they (practically) are — Come on, you remember hating that teacher who treated you like a child. Give them the benefit of the doubt, understand that they may know something you don’t and act like it. I hope to make it back there, at some point, if some flexibility comes my way at my new job, but, unfortunately, a three p.m. start time in a neighborhood that is probably 30-35 minutes from my work doesn’t make that seem likely anytime soon.